A year later (a few months before his 30th birthday), Mike told me he still really wanted me to finish the quilt and that he would be willing to cut each of the squares himself if it would help me get it finished for him by his birthday, so I eagerly agreed and let him go at it. Mike was so cute and sat for hours that day on the living room floor carefully hand-picking and hand-cutting every square according the measurements I gave him (we won't mention the "mishap" here). He cut squares out of the back pockets "to hold the TV remote control" and even cut squares out of paint stained pieces "to make it look cool". He had a perfect vision of how he wanted the quilt to look and got it laid out on the floor exactly the way he wanted. The next day I got it sewed together (minus the border, which Mike was still cutting) and went out to purchase the batting and backing material so I could get it finished for him by his birthday. Unfortunately life got the best of me again and the quilt sat unfinished for yet another year until my mom (an amazing quilter) called me a few weeks ago and offered to help me get it finished for Mike's 31st birthday this year. So I sent her home with everything and she got the border sewed on and then got it set up on a quilt frame at her house so we could tie it. I spent an evening at her house last week tying it and then she spent last weekend binding it so it was all ready to finally give to Mike. On Thursday night we had tickets to the Hale Center Theatre out by my parents house to see Joseph and the Amazing Technicolor Dreamcoat (which was fabulous). 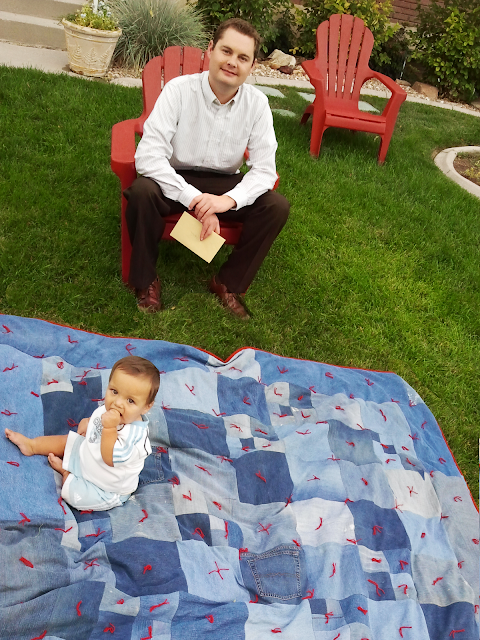 Since my parent's were planning on babysitting Bryson for us while we went to the show, we decided to surprise Mike with the quilt when we stopped by before the show to drop Bryson off. Mike had no idea we had even been working on the quilt and was SO surprised when he walked into my parents house and saw it sitting there finally finished! He's been so patient over the past 2 1/2 years and is so happy to finally get to enjoy it.